If you accidentally delete a document that exists only on iCloud, you can’t just pull it out of the Trash — but you can get it back. Mac users have long had a relaxed, laissez-faire attitude to deleting things. If you throw something away, then realise you ought not to have done that, you can grab it from the Trash. Easy. Of course it gets much harder if you’ve emptied the Trash, but before you do that you get all sorts of scary messages to make sure you don’t do it accidentally. That sense of security ended, however, with the introduction of iCloud and applications like Pages and Numbers that save their documents in iCloud. If you delete a document from Pages, for example, it’s gone — just … gone. Like dust in the wind, never to be seen again. Sort of. 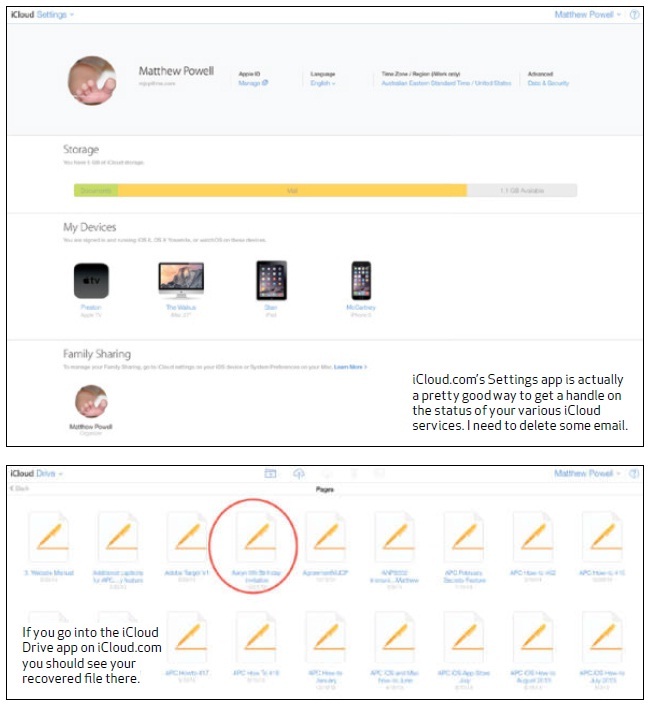 There is actually a way to get accidentally deleted iCloud documents back, but for whatever reason Apple does not make it obvious. And it only works if you’re using iCloud Drive, which means you need Yosemite on your Mac and iOS8 on your iOS devices. 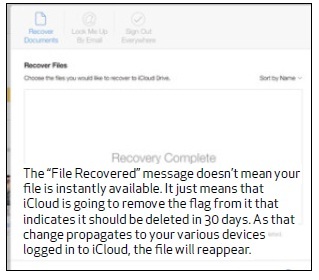 (There remains no way to recover accidentally deleted iCloud files using your iOS device — even the iCloud Drive app in the iOS 9 Public Beta doesn’t appear to address the issue, though this is a beta so the problem may be addressed by the time it ships.) First, you need to fi re up your web browser. 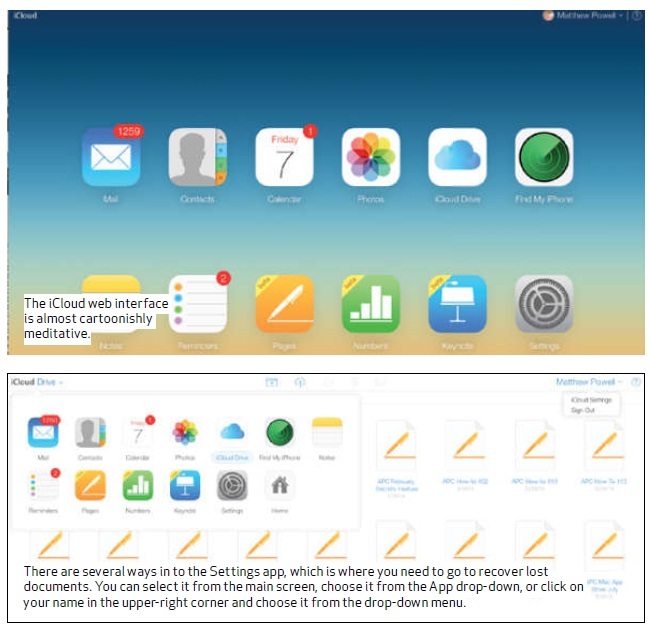 The only way to recover iCloud documents is via iCloud.com on the web (which, bizarrely, you cannot do on an iOS device — why, Apple, why?). Go to iCloud.com and enter your iCloud username and password. You’ll be presented with a lovely gradient to calm your nerves and help you not panic about recovering that lost fi le. You’ll also see a series of icons representing the various applications available to you using iCloud. 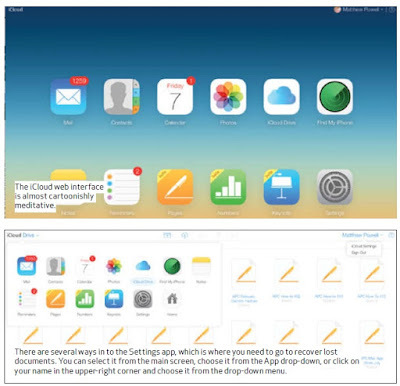 You may think that your next step is to click on iCloud Drive and then click on the Trash icon to see what fi les you’ve deleted and recover them. This would be analogous to the Finder interface you know and love so well. But you would be wrong, because that’s not how this works at all. The Trash icon in iCloud Drive is just for deleting things. No, what you want to do is click on Settings. For some reason. There you will see how much storage you’ve used, which devices are logged in to your account, and which Apple IDs are connected to Family Sharing (if you have set that up). You’ll also see a range of options for managing your Apple ID, and changing the language, time zone and geographic region associated with your iCloud account. And right at the end you’ll see an option called “Advanced” and, under it, “Data & Security”. Click on that. What’s that, you say? All I want to do is recover a fi le I accidentally deleted. Why do I have to go into the Advanced Data & Security settings like some sort of geek? Because Apple made it that way. That’s why. Click on Data & Security, and you’re presented with three tabs. The fi rst one is Recover Documents, and should be selected by default. In that tab, you’ll see all the fi les that have been deleted in applications that use iCloud Drive but are still available to be recovered. You have about 30 days from when you accidentally delete something to when it really is gone for good — that should be enough time. If you delete something and only realise two months later that you needed it, you didn’t really need it. As an aside, it seems odd that Apple has built in that 30-day grace period to recover fi les, given how obscure and counter-intuitive the process for making use of it is. Tick the box next to the fi le you want to recover, and the option to “Recover File” appears in the lowerright corner of the window. Click on that, and after a bit of buzzing and whirring the fi le will disappear from the list and you’ll get a message saying that it has been recovered. Note that it can still take a few minutes to show up on iCloud Drive on all your devices, which have to sync first.